Born free 70ml Bergamot & Lavender is out of stock. Now creamier and softer to skin! If you have been using Crystal deodorants looking to avoid aluminium, they might not be your best choice, as you might not be aware that they do contain aluminium. Aluminium is widely recognized as a neurotoxin, which has been found in increased concentrations in the brains of people with Alzheimer’s disease. A 2006 study found that aluminium salts can mimic the hormone estrogen, and chemicals that imitate that hormone are known to increase breast cancer risk. Animal studies have also found that aluminium can cause cancer. In a 2007 study published in the Journal of Inorganic Biochemistry, researchers tested breast samples from 17 breast-cancer patients who had undergone mastectomies. The women who used antiperspirants had deposits of aluminium in their outer breast tissue. Concentrations of aluminium were higher in the tissue closest to the underarm than in the central breast. Aluminium is not normally found in the human body, so this study was a clear indication that the metal was being absorbed from antiperspirant sprays and roll-ons. While Manufacturers claim Crystal deodorant to be aluminium-free, they are referring to aluminium chlorohydrate, aluminium chloride, aluminium hydroxybromide or aluminium zirconium. The aluminium in crystal deodorant stones is a different type of compound known as an alum, the most common form being potassium alum, also known as potassium aluminium sulfate. What the suppliers of crystal deodorants are actually selling is the most absorbable form of aluminiuim you can put on your skin. The manufactures also claim that Potassium Alum or Ammonium Alum are natural mineral salts made up of molecules that are too large to be absorbed by your skin. But at Unica we want to play safe, because we believe that there is no such a thing as a 'safe aluminium. 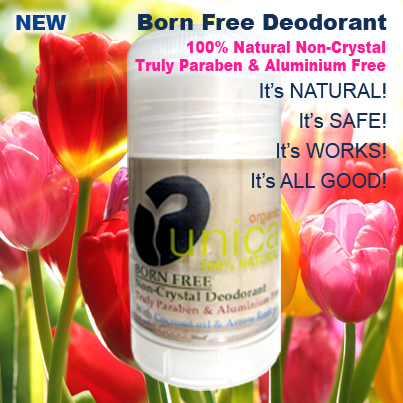 Unica Born Free organic deodorant is100% Natural & 100% Safe, truly Paraben & Aluminium free. 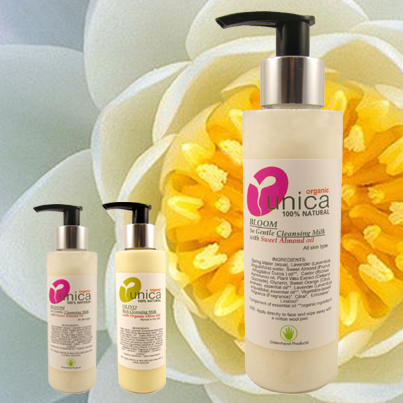 Made with Coconut oil for its moisturizing & antibacterial properties, Kokum butter for its excellent emollient and soothing action, Bicarbonate of soda, Arrowroot and Oat powder for their moisture-absorbing and anti-inflammatory properties and Calendula for its regenerating and antibacterial action. Born Free is naturally scented with essential oils. Born Free organic deodorant is your daily Natural Confidence packaged in a practical twist up stick. It's Natural, it's Safe and it Works! USE: Turn the bottom of the stick anti-clockwise. Apply sparingly to freshly washed and dried skin and massage into skin. Alternatively, rub your fingers on deodorant and apply to underarms. It does not stain and light marks on clothing are easily removed. STORAGE: Store in a cool place away from direct sunlight because Born Free is a temperature-sensitive product. INGREDIENTS: Coconut (Cocos Nucifera) oil*, Kokum (Garcinia Indica) Butter*, Vitellaria nilotica (Shea) Fruit Butte*, rSunflower (Helianthus Annuus) oil*, Candelilla (Euphorbia Cerifera) wax, Arrowroot (Maranta Arundinacea Root) Powder, Oat (Avena Sativa) Flour*, Bicarbonate of Soda (Sodium Bicarbonate), Calendula (Calendula officinalis), Vitamin E natural (Tocopherol), Clove (Eugenia Caryophyllata) Bud oil, Rosemary extract (Rosmarinus Officinalis), Tea Tree (Melaleuca Alternifolia) essential oil*, Xanthan Gum (natural thickner); natural components of essential oils: Eugenol, Isoeugenol, limonene, Linalool. Because of its high moisture retaining capacity, coconut oil is s an excellent moisturizer. It contains mostly fats, so it acts as an emollient providing a softening and soothing effect increasing the levels of skin surface lipids. Coconut oil also possesses unique antiseptic & AntiMicrobial properties. 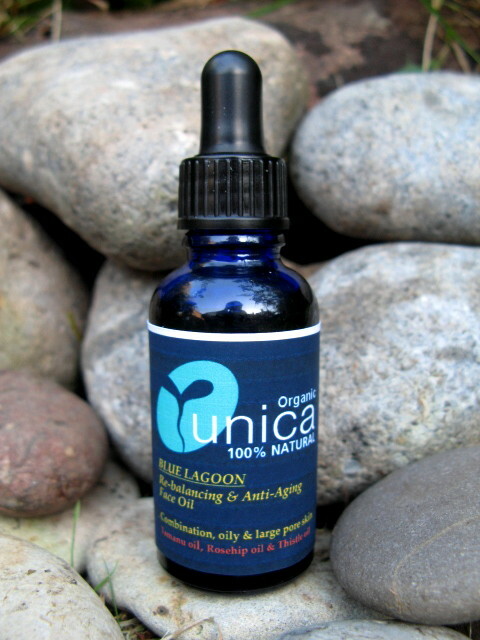 The medium chain fatty acids (MCFA) present in coconut oil, especially lauric acid, capric acid and caprylic acid, have been shown to possess antibacterial, antiviral and antifungal properties, protecting the skin from many sorts of microbes, and treating various skin conditions like psoriasis, dermatitis, eczema and many other skin infections. Because of its remarkable antibacterial properties, coconut is also used as an effective natural deodorant. Anti-ageing, anti-irritant, moisture absorbing, cleansing and moisturising properties. Due to its anti-irritant and soothing properties, Oat Flour has not only the ability to soothe and calm but is also a highly moisturising skin agent. Derived from tuberous rhizomes of the Maranita arundinacea plant, arrowroot is light, soft and absorbent . Has great moisture-absorbing properties and s oftens skin. It can also be used to help dry up blemishes, rashes, or other sores or wounds. Because it's is a product of the West Indies, arrowroot has a rich history in the culture and it's said that it's very name was derived from the indigenous tribe of the Arawaks.Historians say that the Arawak people used arrowroot powder to draw out poisonous toxins from those wounded by the tip of poisoned arrow. Kokum butter is a solid fat obtained from the seeds of the Garcinia indicia tree which is processed and refined to produce a creamy white butter. anti-oxidant properties. It has the ability to soften and soothe dry, irritated or Inflamed skin and helps to reduce fine lines and wrinkles. 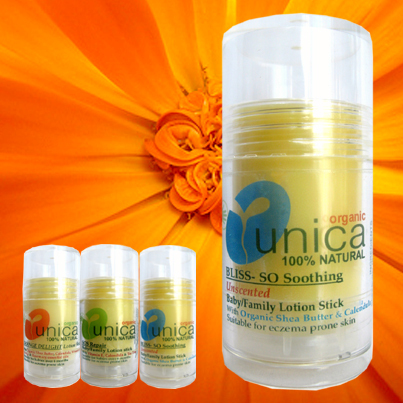 Best option for sensitive, dry and mature skin. Kokum butter is non-comedogenic and quickly absorbed, leaving the skin soft and silky without a greasy feel.